Prior to the iPhone’s(s AAPL) launch in 2007, my go-to PDA was a Dell Axim(s DELL), and the biggest complaint I had with it was that syncing notes and to-dos often required a mystical shaman and some incense. The iPhone, I thought, will solve this problem. The joke was on me since it wasn’t until this year I could easily sync to-dos. Now with OS X Mountain Lion, which should arrive some time this summer, true feature parity for Notes, Reminders and Notifications comes to OS X. I’ve spent some time with the new features, and I’m eager to share my experiences with you. Notes syncing from iOS back to OS X has always struck me as a tacked-on feature, with notes buried in Mail.app, making viewing and editing notes awkward and unpleasant. With Mountain Lion, notes get their rightful position in their own app. The Mountain Lion version is a near-duplicate of the iOS version, and I do not view that as a criticism, because Notes on iOS is very elegant in its simplicity. What I found interesting is while Notes can be turned on and off via the iCloud System Preference, it apparently still uses IMAP for some of the backend transfer as I was asked to enter in my passwords for my Gmail accounts. Notes appear to sync quickly, within a minute or so of being edited. I’m really excited about Notes being easier to use in OS X. I swap between Evernote and Notes for my note-taking needs, with Evernote getting my article-length notes clipped from the web or imported PDFs, and Notes getting my day-to-day notes, like what printer my Mom has, dial-in codes for meetings, meeting notes, etc. Reminders, formerly To-Dos, made a lot of sense living in iCal pre-iOS. However, the Calendar iOS app never had to-dos, and with the advent of the Reminders iOS app, it became very uncomfortable having them stored in iCal. I always found iCal’s handling of to-dos unwieldy, and being stuck in a small pane off to the side didn’t help. It’s been said that the areas of OS X and iOS that are the most polished are the ones Steve Jobs was very involved in — if so, I’m fairly confident the man never managed a task list in iCal. Now with Mountain Lion, to-dos are moved to their own Reminders app, and life couldn’t be better. It’s a nearly identical copy of the iOS app in looks and function, with two big differences: on OS X you can choose if a list is on iCloud or your Mac, and I cannot see a way to set a location-based reminder. While OS X isn’t really location aware (even though it does have Find my Mac), it would be nice if I could set a reminder in OS X for something I need to do at work and have my iPhone remind me when I get there. 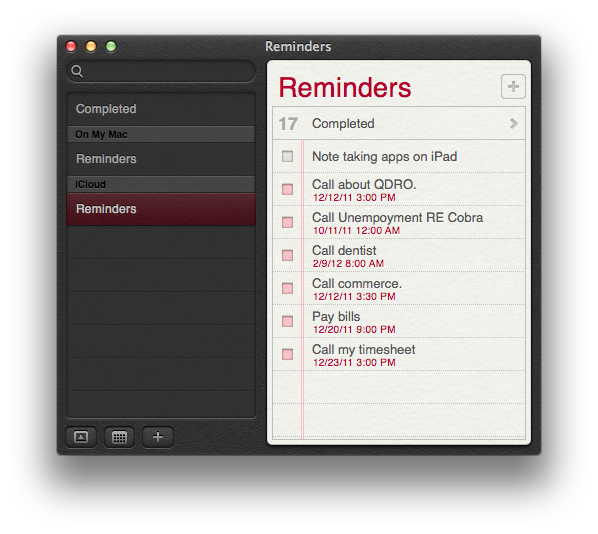 Overall, I’m happy with Reminders in Mountain Lion as it allows me to easily manage my to-dos. While I still expect to handle most of my project-level task management in OmniFocus, Reminders will be the app I use to remind me of life’s daily minutiae. The last of what I call the Big Three features to migrate from iOS to OS X is Notifications. Users of Growl will find Notifications very similar as notifications are displayed in the upper right-hand corner. As with iOS, you can choose if an app displays a banner, an alert that shows up in the middle of the screen, a badge icon, or all three. Right now, obviously, only the apps built into Mountain Lion are supported. According to this piece by John Gruber, only apps acquired from the Mac App Store can send events to Notifications. As an aside, you can configure Mail.app to only alert you if you receive an e-mail from someone you have flagged as a VIP, which helps cut down on the popup clutter. So far my experiences with Notifications have been light, with not many apps supporting it. I’m not sure if Notifications will ever fully replace Growl for me since not all the apps I rely on Growl for are available in the Mac App Store. Apple’s headline on the Mountain Lion web page is “Inspired by iPad. Re-imagined for Mac,” and that’s pretty much true based on my usage of it so far. I’m happy there is feature parity between iOS and OS X for Notes and Reminders. If you don’t complement your Macintosh with an iOS device, you may not derive the same excitement I do from these new features. But if you’re a heavy user of Notes and Reminders you will be thrilled that these apps are now on OS X. One hope I have, with OS X moving to a yearly upgrade cycle, as iOS has always had, is that features that complement each other on both operating systems will be released at the same time, and not with the lag we currently have. Mark, do you know if it’s possible to drag a reminder into iCal to create an event. As you know this doesn’t work in Lion but works in iCloud. I find the synching unpredictable… It’s instant sometimes, other times not so much. I’ve actually ditched Evernote for Catch after realising that the app is practically unusable once you’ve passed your monthly quota. It’ll drive you nuts with notifications and warnings (so you’d purchase more space, $5/1GB) instead of leaving you to take notes w/o synching. Horrible experience. Just for text notes, Notes.app is ideal, and less bloated then Evernote. Mark , I agree with what you have said completely. I just wish this was all put into Lion as a point update. The could of released iOS 5.1 and 10.7.4 at the same time and had all these features. My only concern is apps in the app store, i dont want to not have the ability to download apps that are not in the app store, its ok so have a closed phone OS but not a computing OS. Cant wait for the finished product! I agree, but am holding out until we see what ML really costs. It’s easy to point to Lion and Snow Leopardâ€™s $29 price as wat ML will cost, but Apple also sold the iOS upgrade for the Touch at $5. I would not be surprised to see an under $10 ML price.